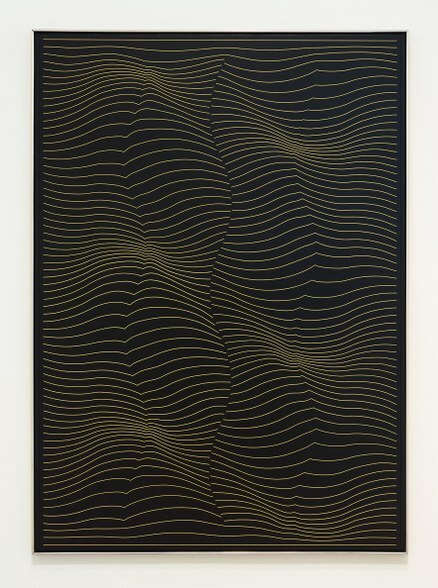 Julian Stanczak's two-dimensional paintings of thin lines of contrasting color vibrate and morph as though they were operating in three-dimensions. 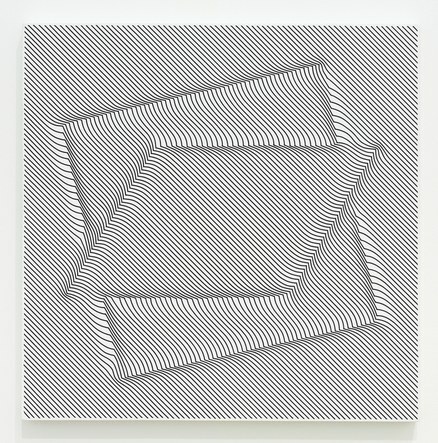 The name of the movement known as Op Art was coined after his 1964 show at the Martha Jackson Gallery in New York. Julian Stanczak: Duo, on view at Diane Rosenstein Gallery in Hollywood, is the first in LA since the artist's death last March. 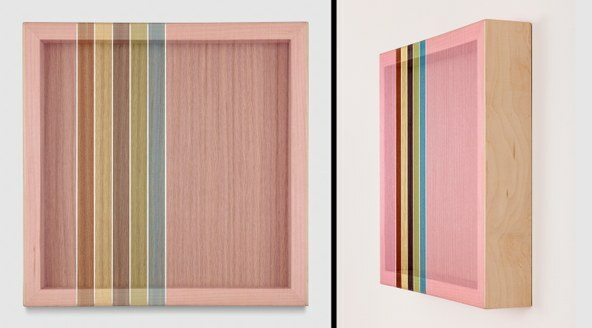 As suggested in the title, the dozen paintings made between 1968 and 2011 were produced using only two colors but in hues or tones that registered as energy and light. 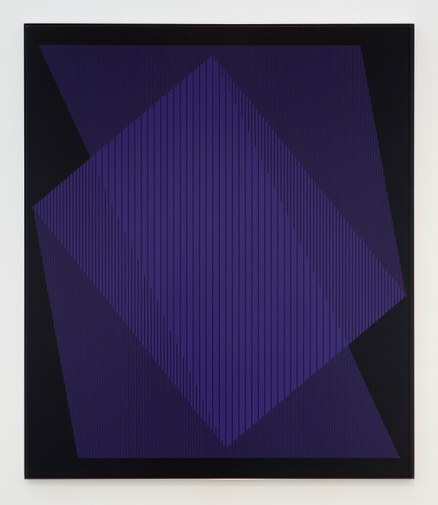 A major painting in the show, Offering Violet (1970), was made six years after his initial critical recognition. Narrow strips of purple and black are arranged precisely in a pattern that radiates from dark to light (or vice versa) and lends the appearance of layered rectangles and trapezoids. Stanczak did not work from preliminary drawings or, obviously, computer graphics. Though the paintings date from many decades of his output, they seldom vary in concentration and effect. This would be impressive from any artist, but Stanczak accomplished it after losing the use of his right hand while interned as a youngster in a Siberian labor camp during World War II. The Polish-born artist trained himself to use only his left hand and later felt it helped him concentrate on rigorous technique as a relief from the painful emotions of his early experiences. He immigrated to Cleveland, Ohio in 1950 and taught for decades at the Cleveland Institute of Art, which came to be known as a center for such art. 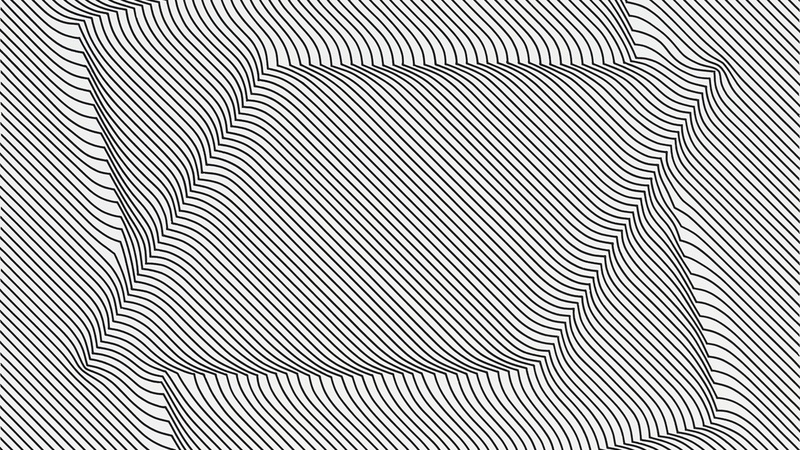 Stanczak was included in the important Museum of Modern Art exhibition The Responsive Eye in 1965 and never wavered from his fascination with the optical response to tonalities of color and line. On view through October 21. If that seems a preoccupation of the past, such a view will be corrected by a visit to the show of Brian Wills at Praz-Delavallade Gallery in mid-Wilshire. The artist strings taut colored rayon and metallic threads across the fronts of wooden shadow boxes. Frontally, they can appear as solid bands of color. From the side, the color can all but disappear to reveal the space behind, the shadows or the wall. Wills' sensibilities range from soft pastel, including a lovely pink, to strident intensity. For one series, he paints the inside of each of five vertical boxes in a sharp orange, violet, blue, turquoise or green and stretches the strings in the same tones so that they meld together visually. His exploration of optics may not be done with paint exclusively but his idiosyncratic methods trick the eye into concentrating on the very act of perception.